I seem to have something of a chocolate and peanut butter theme going on this site. So far I’ve covered chocolate and peanut butter cookies, brownies, candy, and now ice cream. Can you tell it’s one of my favorite flavor combos ever? Last week my mom had a rough couple of days, so I decided to bring an indulgent treat with me when I visited her over the weekend – chocolate and peanut butter ice cream. As you can imagine, I’ve tried many variations of chocolate and peanut butter ice cream in my lifetime. Most store bought versions fall way short of my expectations, but this recipe was everything I had hoped it would be! After making a batch to take to my mom’s house and popping it in the freezer, I gave the spoon a little lick, you know, to see how it turned out. And then I stood in my kitchen for the next 10 minutes unabashedly licking the bowl clean. But let’s just keep that between you and me, OK? As soon as I returned home, I immediately made my own batch that I wouldn’t have to share with anyone. It’s that good! 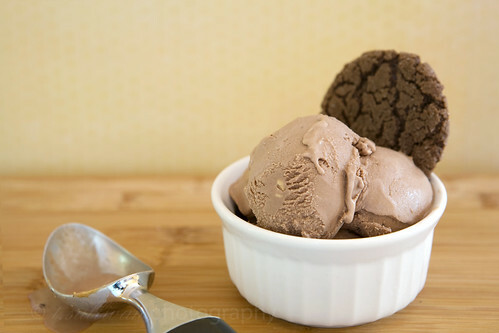 The ice cream itself has a creamy milk chocolate flavor with just a hint of peanut butter. The real star, however, is the dollops of creamy salty peanut butter hidden throughout. The contrast of salty and sweet keeps my spoon digging in for more over and over again. 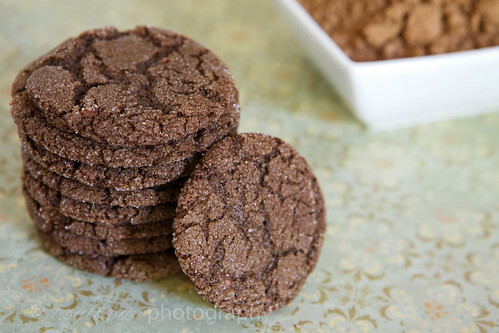 As if chocolate peanut butter ice cream isn’t indulgent enough on it’s own, I know my dad is a big fan of cookies with his ice cream so I whipped up a batch of chocolate sugar cookies too. They’re a great crunchy sidekick to the creamy chocolate peanut butter ice cream, and if you’re feeling really decadent, you can use two of them to make an ice cream sandwich! I love the simplicity of this recipe and the fact that is uses no eggs or heavy cream. I imagine it’s the peanut butter that thickens the ice cream while adding enough fat to keep it creamy, so don’t leave it out! Also, don’t skip the plastic wrap when making the peanut butter patties. Once frozen, the plastic wrap easily and gently releases the patties. Combine the half & half, cocoa powder, sugar, and salt in a saucepan over medium high heat. Stir the mixture frequently until it comes to a full, rolling boil. Remove from the pan from the heat and stir in the peanut butter until well blended. Chill the mixture covered overnight in the refrigerator. In the meantime, make the peanut butter patties. Stir together the peanut butter and sugar in a small bowl until thoroughly combined. Cover a dinner plate with plastic wrap. Using a spoon and your finger, scoop up small pieces of the peanut butter mixture, about ½ teaspoon each, and drop them onto the wrap covered dinner plate. It may help to refridgerate the peanut butter for a few minutes, to make it less sticky. Once you’ve used all of the mixture, put the plate in the freezer overnight. In a food processor or electric mixer, combine the flour, cocoa, baking soda and powder, salt, and sugar. Add the butter and then the egg on low speed, or while pulsing. Continue mixing until dough comes together. Measure a couple of table spoons of sugar into a small bowl. Roll about a tablespoon of dough between your hands to form a ball, then roll the dough in the bowl of sugar, coating the outside. Place on a parchment paper or Silpat lined baking sheet approximately 2 inches apart and slightly flatten the dough with your hands. Bake for 9-10 minutes. Allow cookies to cool for 3 to 4 minutes on the baking sheet, then place on a wire rack to cool completely. I love peanut butter and chocolate together! I may have to try that this weekend. WOW ice cream sandwich or not.. I cant decide! YUM just incredible combination really! Wow. This looks delicious and sounds absolutely perfect. I went through a peanut butter and chocolate phase on my blog a few months ago. It was delicious! But I haven’t tried ice cream and yours looks so good – thanks for the idea. I will certainly be making this. THANK YOU!!! Everything about this post spells PERFECT to me. 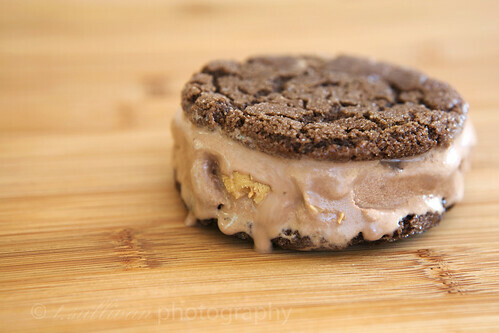 Especially the melting cookie ice-cream sandwich!!! Jumped over here from Dinner & Dessert. I am going to make this ice cream. TODAY. Thanks to you, I’m going one step further and making ice cream sandwiches. Thank you!